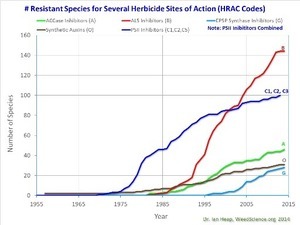 With GM crops come herbicides, which breed resistant weeds. This has happened in about a decade for the worse mutants. We can reverse the problem by reversing the spraying, using plowing, cultivation, and crop rotation instead. This entry was posted in Agriculture, Agrochemicals, Corn, Deep-till, Economy, Glyphosate, No-till, Okra Paradise Farms, Plowing, Soybeans and tagged Brown Dog, corn, cotton, crop rotation, cultivator, Georgia, Glyphosate, GM, GMO, Gretchen Quarterman, herbicide, John S. Quarterman, Lowndes County, No-till, Okra Paradise Farms, organic, Plowing, profit, Roundup, rye, Soybeans, tilling, Yellow Dog on July 31, 2014 by John S. Quarterman. Likely effects of dousing 90+% of all corn, soybeans, peanuts, and cotton grown in Georgia (and elsewhere) in Roundup and other toxic chemicals, often drifting onto other people’s land, schools, shops, and churches. It’s not that hard to grow the same crops without those poisons and without the toxic seeds that require them; not that hard and more profitable. Yes, I know Jeffrey M. Smith is not a biological scientist or medical doctor. But many of the sources he cites are. The IRT release also indicated that glyphosate, a weed killer sold under the brand name ‘Roundup’ was also found to have a negative effect on intestinal bacteria. GMO crops contain high levels of the toxin at harvest. “Even with minimal exposure, glyphosate can significantly reduce the population of beneficial gut bacteria and promote the overgrowth of harmful strains,” the report found. This entry was posted in Agrochemicals, Corn, Glysophate, Soybeans and tagged Agrochemicals, alfalfa, beets, canola, Celiac Disease, corn, cotton, Georgia, gluten, Glysophate, GMO, Hawaiian papaya, oil, Roundup, Soybeans, sugar, yellow swuash, zucchini on December 7, 2013 by John S. Quarterman. Now easier to vote at the checkout counter (or the farmers market), at least for non-GMO meat. The Agriculture Department has approved a label for meat and liquid egg products that includes a claim about the absence of genetically engineered products. It is the first time that the department, which regulates meat and poultry processing, has approved a non-G.M.O. label claim, which attests that meat certified by the Non-GMO Project came from animals that never ate feed containing genetically engineered ingredients like corn, soy and alfalfa. This entry was posted in Agriculture, Corn, Food, Okra Paradise Farms, Soybeans and tagged Agriculture, alfalfa, corn, Food, Georgia, GMO, John S. Quarterman, Lowndes County, Meat, Non-GMO, Okra Paradise Farms, Soybeans, USDA on June 25, 2013 by John S. Quarterman. Monsanto is always hiding behind something, starving children (while selling their parents crops that fail all at once), the Great God Efficiency, or now, medical research. Will Clarence Thomas recuse himself this time on this Supreme Court seed patent, Bowman v Monsanto? Will Monsanto manufacture enough Fear, Uncertainty, and Doubt (FUD) to win anyway, or will the other SCOTUS judges rule wisely this time? Monsanto says that a victory for Mr. Bowman would allow farmers to essentially save seeds from one year’s crop to plant the next year, eviscerating patent protection. 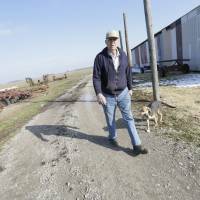 In Mr. Bowman’s part of Indiana, it says, a single acre of soybeans can produce enough seeds to plant 26 acres the next year. The decision might also apply to live vaccines, cell lines and DNA used for research or medical treatment, and some types of nanotechnology. Yeah, yeah, it could. But it would be quite easy for SCOTUS to say this ruling is about seeds. Many organizations have filed briefs in support of Monsanto’s position — universities worried about incentives for research, makers of laboratory instruments and some big farmer groups like the American Soybean Association, which say seed patents have spurred crop improvements. The Justice Department is also supporting Monsanto’s argument. This entry was posted in Agriculture, Agrochemicals, Glysophate, History, Law, Politics, Soybeans and tagged Agriculture, Agrochemicals, efficiency, Glysophate, History, Hugh Bowman, Law, medical research, Monsanto, patents, Politics, seeds, Slash, software patents, Soybeans on February 16, 2013 by John S. Quarterman.